Our Wine Of The Week is 1999 Rosenblum Cellars Richard Sauret Vineyard Zinfandel grown in Paso Robles. A favorite part of the Christmas season is watching all the wines that pass among friends, family and business associates as gifts and brought to dinners and parties. Among the sea of current releases of common labels, we sometimes find a unique wine from a personal collection that is no longer available in shops. Our Wine Of The Week is such a bottle, a well-aged Zinfandel with adjacent vintages rated 92 points by Wine Spectator and received as a Christmas gift this year at Wine Adventure base camp. Pundits estimated its cellar life at 8 to 10 years, so pulling the cork a month shy of 20 years was going to be interesting. Amazingly this Zinfandel held up well, still exhibiting 92 point characteristics expressed in subtle fruit backed by spice and dark berries, cinnamon and a little pepper. Let it breath for an hour and hints of cocoa and chocolate chime in. If you come across a properly-stored bottle of this vintage, don’t shy away just because of the age, consider giving it a try. Original retail at release was about $22, it’s worth easily three times that now. 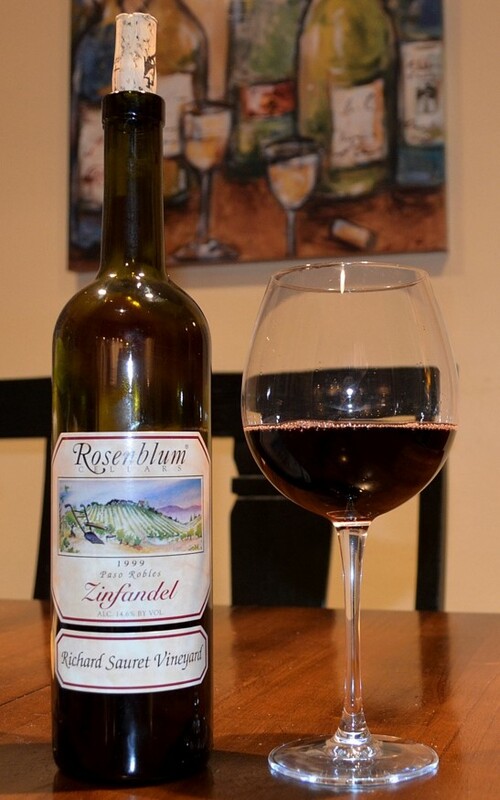 Rosenblum’s current Zinfandel releases (2013, 2014) range in price from $28 to $50 and are equally deserving of an exploratory sip. The Rosenblum Cellars tasting room is located in downtown Oakland, California in Jack London Square next to the Bay Ferry terminal.